The Inspiring Rags To Riches Story Of Chef Gordon Ramsay. From an abusive childhood to masked robberies and eventually becoming one of the richest celebrities in the world, the biography of Gordon Ramsay certainly makes for an incredible rags to riches story. As an entrepreneur, chef Ramsay’s a living breathing example of doing whatever it takes to succeed. So, how did Chef Ramsay get started? 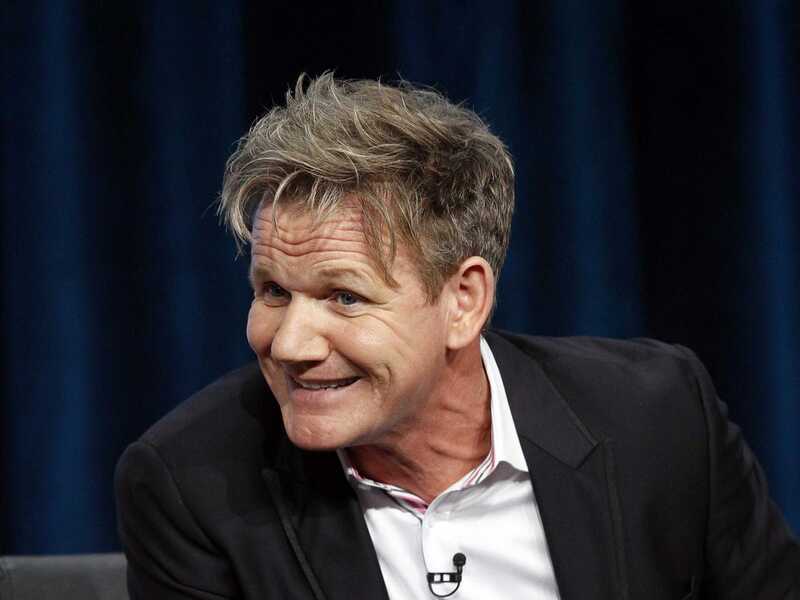 Gordon Ramsay grew up in Stratford-upon-Avon, the second of four kids, moving from one council flat to another thanks to the on-again, off-again career of his violent, alcoholic father. His mother worked in a tea shop, his brother did some jail time for heroin possession, and he describes himself as an abused, fearful child. Growing up, his escape was sports. Unfortunately, a knee injury at the worst possible time – just as he was on the verge of becoming a professional footballer – forced him to turn to cooking, his next love. things took a dramatic upswing. In fact, he was the first Scottish chef to win three Michelin stars (he now has 16 to his name); he’s been awarded the Order of the British Empire (OBE) by the Queen, and he owns restaurants in Dubai, Tokyo, New York, London, Ireland, Los Angeles, Montreal, and other top locations. And that’s just from his success as a chef! There’s a whole other section to Gordon Ramsay’s biography. He’s a highly successful TV star with multiple programs to his name, millions of weekly viewers across the globe and a reported pay packet of $400,000 an episode! Oh, and he’s also a marathoner and an Iron man competitor, and a husband and father to four kids. Whew! It’s clear to see that Gordon Ramsay’s business strategy has paid off. In fact, no celebrity chef has ever earned as much as him. So exactly how rich is Chef Ramsay? Brace yourselves! Gordon Ramsay, the kid from the council flat, has a net worth of $54 million (according to www.Forbes.com), making him the 34th highest paid celebrity in 2016. Fifty-four million dollars. Damn! His income is split between his restaurants, media and television appearances, consultations, book publications and a line of home and kitchen appliances. Recently, he’s released a mobile game, Gordon Ramsay Dash, which looks set to make him millions from royalties and is currently one of the top-grossing apps in the Android and iOS app stores. He also has numerous apps, including the mega-successful Cook With Me app for home chefs, and has published or co-authored a number of books. With all that on his plate, you know that Gordon Ramsay must be as hard on himself as he is on the juniors in his TV shows. And that brings us to our next question. What is Gordon Ramsay’s leadership style? Ramsay has said that he thrives on pressure, and is incredibly high octane onscreen. Famous for language that would make a sailor blush, Ramsay’s TV rants are often a series of bleeps. There’s always swearing and screaming (from him) and crying and shaking (from his chefs) on his TV shows. He laughs it off, saying that it’s part of who he is, but he won’t allow his kids to watch him on TV. Having worked with the notoriously hot-tempered Marco Pierre White early in his career, it’s easy to see where Gordon Ramsay’s leadership style comes from. Even when he’s toned down the F-words, Ramsay doesn’t need to swear to make you wince. Some of his most creative insults are enough to make starry-eyed juniors give up on all their dreams. However, an article written on him in 2005 claims he’s retained almost 85% of the staff from 1993, in some capacity. That says a lot for Ramsay’s leadership style and his ability to inspire loyalty. His own protégé and Hell’s Kitchen winner, Chef Christina Wilson, who is the Executive Chef at Gordon Ramsay BurGR at Planet Hollywood Casino in Las Vegas, knows that he holds his staff to the same rigorous standards he sets for himself. “When he blows up, it’s during dinner service because his name is on it and he expects you to uphold his standards” she says. How does Gordon Ramsay manage his work-life balance? He doesn’t, and he’s unapologetic about it. With four children, he’s often said that couldn’t be a hands-on father. “You can’t run a restaurant and be home for tea at 4:30 and bath and change nappies.” His wife, Tana, is a school teacher, and Ramsay says they decided that he would work and provide the support, while she looked after the kids. However, he manages to find time to play football with his son on Saturdays, and also helps his 14-year old daughter, Tilly, with her own successful cooking show. This work hard, play hard style is the cornerstone of Gordon Ramsay’s business strategy, helping him get the best out of life and out of business. The celebrity chef and athlete makes time for his passion – sports. What does it take to go from the humble beginnings of a council flat to one of the most recognized chefs in the world? A whole lotta rejection, by the sound of it. Going through the biography of Gordon Ramsay, you’ll see how important sports is in his life. If cooking is his art now, football has always been his passion. From the age of 12, he was playing for local clubs and aiming for the bigger association football games. But his sporting life was plagued with injuries. He suffered a serious knee injury when he played with a cartilage injury, causing a torn ligament. When he was let go from his team, Gordon Ramsay was gutted. He had already developed an interest in food, so decided to become a good cook instead of an average footballer. There’s a lot of lessons we can learn from Gordon Ramsay but the reason why I consider him to be a great motivational case study for any entrepreneur is his dogged determination and resilience in light of whatever life throws at him. As an entrepreneur, there are days when it seems like you’ve reached the end of the road, and Gordon Ramsay has definitely come up against those days. And that’s where the fighting spirit kicks in. He says his difficult childhood helps him avoid depression as an adult, and regardless of what challenges he faces – whether that’s losing Michelin stars or fighting against recession and falling profits – one thing’s for sure; Chef Ramsay’s always going to dust himself off and came back stronger than ever. And it’s this resilience and ‘never give up’ attitude that makes him a perfect motivation for any entrepreneur!